Minnesota job growth has been fairly healthy in recent years, relative to the rest of the nation and neighboring states. Last month, a North Star article showed that Minnesota has surpassed the national average on multiple economic indicators—including job growth—during the current business cycle (i.e., since 2007). A recent Economic Policy Institute (EPI) report also examined how Minnesota has outpaced neighboring Wisconsin in job growth and many other areas. Minnesota’s track record in job creation becomes more impressive in the context of its low unemployment rate. Throughout recent history, Minnesota’s unemployment rate has been low relative to the rest of the United States. For example, in 2010, Gopher State unemployment was 7.4%, compared to the national average of 9.6%. Thus, one would expect Minnesota to have subpar job growth. However, Minnesota has consistently outperformed the rate of job growth anticipated by its low level of unemployment. For example, a statistical model which takes into account Minnesota’s relatively low 2010 unemployment rate predicts a 7.0% rate of job growth from 2010 to 2017; in actuality, Minnesota employment increased by 8.7% over this period—1.7% greater than that predicted by the model. In other words, Minnesota’s employment growth was significantly higher than we would expect after controlling for its low unemployment rate. The recent EPI report concludes that Minnesota’s superior performance relative to Wisconsin on multiple economic indicators—including employment growth—is almost certainly due in part to divergent fiscal policies pursued in these two states. According to EPI, Wisconsin followed “a highly conservative agenda centered on cutting taxes, shrinking government, and weakening unions.” Meanwhile, Minnesota “has enacted a slate of progressive priorities: raising the minimum wage, strengthening safety net programs and labor standards, and boosting public investments in infrastructure and education, financed through higher taxes (largely on the wealthy).” EPI contends that Minnesota’s progressive policy agenda has translated into greater reductions in poverty and superior growth in wages, income, and employment vis-à-vis Wisconsin. The progressive policies enacted in Minnesota may help to explain why the state’s job growth since 2010 has substantially surpassed the level predicted based on Minnesota’s low unemployment rate. 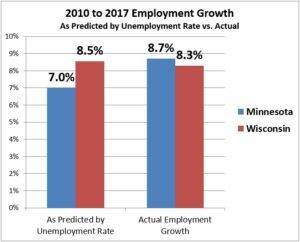 Contrasting policies in Wisconsin may help to explain why Badger State job growth has not only fallen short of Minnesota’s job growth, but also the rate of growth predicted based on its higher level of 2010 unemployment. *Unemployment rates and employment growth in this analysis are derived from Local Area Unemployment Statistics (seasonally adjusted), which is based primarily on the Current Population Survey from the U.S. Bureau of Labor Statistics (BLS). Employment growth is measured from the base year (e.g., 2010) through 2017 (e.g., from 2010 to 2017). (2017 is the most current complete year for which data is available.) The annual unemployment rate in each state in the base year is correlated with employment growth to determine the extent to which variation in employment growth is explained by variation in unemployment rates. During the period from 2009 to 2014, the base year unemployment rate explained as much as 20% of job growth (in 2011) and as little as 12% (in 2009). †Wisconsin’s unemployment rate has improved dramatically since 2010 and is now approximately equal to that of Minnesota. However, a December 2017 North Star analysis reveals that the decline in Wisconsin’s unemployment rate during the current business cycle was not the result of strong job growth (Wisconsin’s rate of job growth was below the national average during this period), but of an especially anemic rate of labor force growth. In contrast, the decline in Minnesota’s unemployment rate was due to a strong rate of job growth, which surpassed its above average labor force growth. ‡The recent EPI report indicates that 2010 to 2017 employment growth in Minnesota was 11.0%, compared to 7.9% in Wisconsin. The resulting 3.1% difference in the Minnesota and Wisconsin job growth rates is far greater than the 0.4% difference observed here. The reason for this difference is due to the fact that the EPI report is based on Current Employment Statistics (CES) from the BLS, while this analysis is based on the Local Area Unemployment Statistics (LAUS), which are derived primarily from the BLS’s Current Population Survey (CPS). Due its larger sample size, the CES used by the EPI is generally a more accurate gauge of job growth than the CPS data used here. (A 2003 paper prepared by the BLS and the U.S. Census Bureau provides an exhaustive analysis of employment growth differences between the CES and the CPS.) This analysis was compelled to rely on LAUS data from the CPS because the CES does not contain information on unemployment levels or rates.